Sitting opposite the first house, this house also deals with "self" issues...but here it's an extension of ourself to the "other", the life partner that we need to make us whole. This is the third of the powerful angular houses, signifying how immensly important it is to have someone to share our self with. 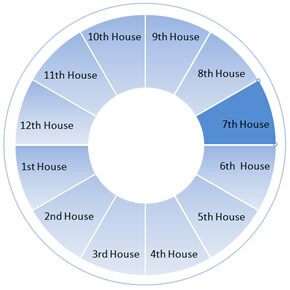 Figuring out how to do that is the domain of the seventh house. Although it doesn't happen a lot, you sometimes hear of couples celebrataing their fiftieth or even sixtieth wedding anniversary. If you spend that much time with someone, you get to know them pretty well! The issue of the seventh house is learning how to give of yourself and how to accept the other...how to cooperate! Newlywed couples have to go through a period of negotiating who's in charge. Years later, if they survive, they will realize that it's not who's in charge but working together to make each other happy. The seventh house is also about other types of partnerships, including business partnerships. The merging of souls isn't quite the same as it is in a love partnership, but the principles are the same...working together toward a common goal.